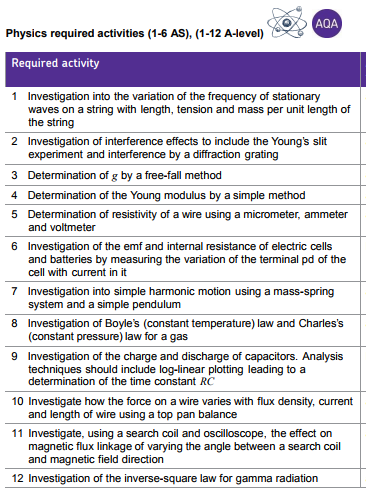 Unit descriptions – Units of study for Year 12. Key concepts in science – Learners will develop an understanding of key concepts relating to biology, chemistry and physics. Centres are encouraged to use practical work to reinforce knowledge and develop learners’ practical skills. Applied experimental techniques – Learners are introduced to new experimental techniques, reinforcing methods met previously and developing practical skills including accuracy and precision. Learners will research the background to a number of analytical and experimental techniques in an applied or vocational context. Science in the modern world – Learners will analyse and evaluate scientific information to develop critical thinking skills and understand the use of the media to communicate scientific ideas and theories. Learners will also find out about scientific careers through the different roles scientists undertake in scientific organisations. Any other relevant information – Topics covered include applied experimental techniques and science in the modern world, undertaking a scientific investigation, and optional units in biology, chemistry and physics. The course is a mixture of externally assessed exams and internally assessed coursework. In Year 12 the spilt is 66% exam and 33% coursework. In Year 13 the split is 66% coursework and 33% exam. Biology involves the study of a wide range of exciting topics, ranging from molecular biology to the study of ecosystems, and from mammoths to microorganisms. Biology is also a contemporary subject that is never far from the headlines. The human genome has been now been sequenced and we know the complete arrangement of the three thousand million bases that make up human DNA. In Kenya 350 people die every day from AIDS and in South East Asia the skies are dark with smoke as the last Bornean rainforests are burned to grow oil palms. Biologists are concerned with all these issues. They work in the fields of cell biology, medicine, food production and ecology…and the work they do is vital to us all. This will give you a firm foundation helping you to develop and deepen your knowledge from GCSE and includes topics such as immunity, gas exchange, biodiversity, and DNA structure. These will extend your knowledge and skills to prepare you for your next steps into industry or further study. The A level course requires you to complete a minimum of 12 required practicals (although we offer numerous other practical opportunities throughout the course). A student that successfully completes the practicals and demonstrates the required level of competence in the skills will be awarded a Practical Endorsement – Pass as part of their A level biology certificate. 6 of the practicals are completed in Year 12 and 6 in Year 13. The practical endorsement is only awarded to those who qualify and to students who study the full A level. They are designed to help prepare students for both industry and/or further study at university level. 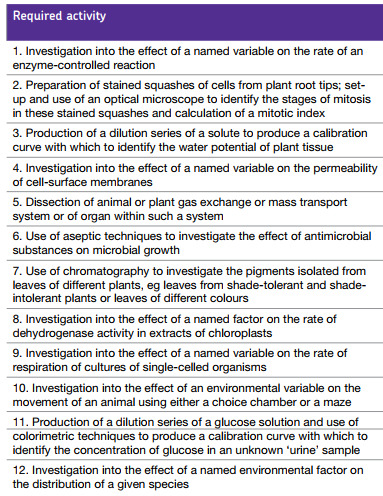 Below is a section from the AQA A level biology specification, showing how the course is assessed. All students will sit the AS papers at the end of Year 12, to give them a good indication of how they are progressing on the course, as well as providing firm data for future university or job offers post Year 13. Students who wish to sit the full A level and move into Year 13 must achieve a suitable grade to continue on the course. What other courses can I combine A level biology with? Therefore if you are interested in biology it can really complement many other areas of study, helping to develop your scientific understanding of the world. Chemistry is the study of matter and its interactions with other matter and energy. Within chemistry you will study three main types of chemistry; organic, inorganic and physical chemistry, you’ll also apply mathematics and logic to real world problems and everyday issues. However, anyone can understand the basics of how things work…and that’s the study of chemistry. The importance of chemistry is that it explains the world around you. We are all chemists. We use chemicals every day and perform chemical reactions without thinking much about them, such as cooking a meal, striking a match or using sun cream. Chemistry is important because everything you do is chemistry! Even your body is made of chemicals. Chemical reactions occur when you breathe, eat, or simply sit and read a book. All matter is made of chemicals, so the importance of chemistry is that it is the study of all matter and the interactions between types of matter; quite simply it is fundamental to understanding how the universe works. In year 1 this will give you a firm foundation helping you to develop and deepen your knowledge from GCSE and includes topics such as energetics, kinetics and organic analysis. 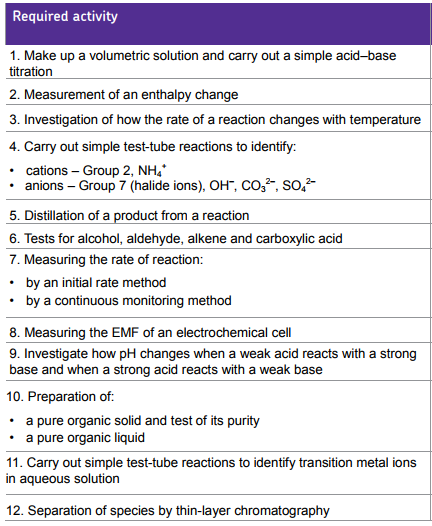 In your second year you will continue to study the three main topics listed above, but in much more detail, including aromatic chemistry, transition metals and chromatography. The A level course requires you to complete a minimum of 12 required practicals (although we offer numerous other practical opportunities throughout the course). A student that successfully completes the practicals and demonstrates the required level of competence in the skills will be awarded a Practical Endorsement – Pass as part of their A level chemistry certificate. 6 of the practicals are completed in Year 12 and 6 in Year 13. The practical endorsement is only awarded to those who qualify and to students who study the full A level. 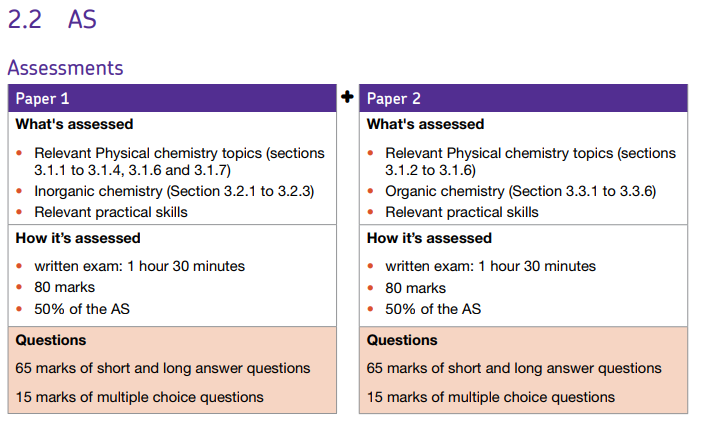 Below is a section from the AQA A level chemistry specification, showing how the course is assessed. 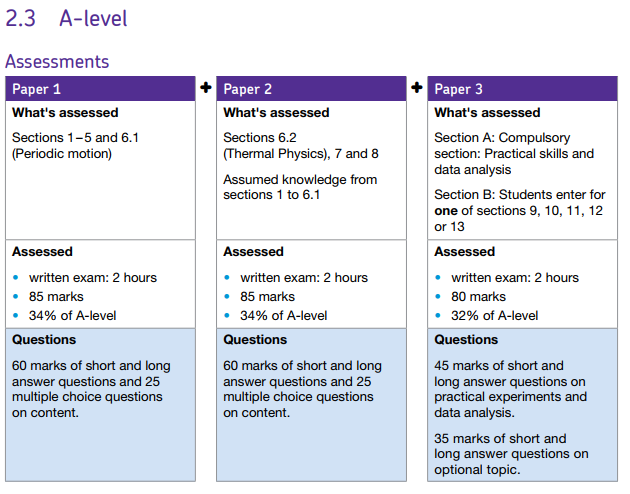 All students will sit the AS papers at the end of Year 12, to give them a good indication of how they are progressing on the course, as well as providing firm data for future university or job offers post Year 13. Students who wish to sit the full A level and move into Year 13 must achieve a suitable grade to continue on the course. What other courses can I combine A level chemistry with? Therefore if you are interested in chemistry it can really complement many other areas of study, helping to develop your scientific understanding of the world. Past students who have completed A-level chemistry have gone on to university to study and industry to work in the following areas; however the possibilities are almost endless. How the planet Earth formed? Why dinosaurs grew so large? If we should we allow fracking? What have volcanoes got to do with diamonds? Could a mega-tsunami strike Britain? Will there be a modern age of mineral extraction in the Southwest? Study A Level Geology to find out the answers to these questions and more . . .
A Level Geology will introduce you to the science which studies the whole Earth. It covers a range of real life geological contexts (e.g. dealing with land contamination or making policy for mineral resource exploitation) and the challenges that face contemporary geoscience. You will learn about geology in a range of different contexts. The course assumes no prior experience of geology but builds on GCSE science concepts that it applies to the study of the Earth to develop an understanding of concepts that have both an academic and practical application. Fieldwork is the arena in which geologists at all levels develop their skills and learn to apply their knowledge and understanding. The A level course requires you to complete a minimum of twelve required field and practical work elements (although we offer numerous other practical opportunities throughout the course) and there are a minimum of four days practical fieldwork. A student that successfully completes the field and practical work and demonstrates the required level of competence in the skills will be awarded a Practical Endorsement – Pass as part of their A level geology certificate. Broadly six of the practicals are completed in Year 12 and six in Year 13. The practical endorsement is only awarded to those who qualify and to students who study the full A level. The examinations in Geology are all synoptic, meaning that they cover all the content of the course. At A level there are a total of 6 hours of examinations (2 x 2 hours 15 minutes and 1 x 1 hour 30 minutes) taken at the end of the course. 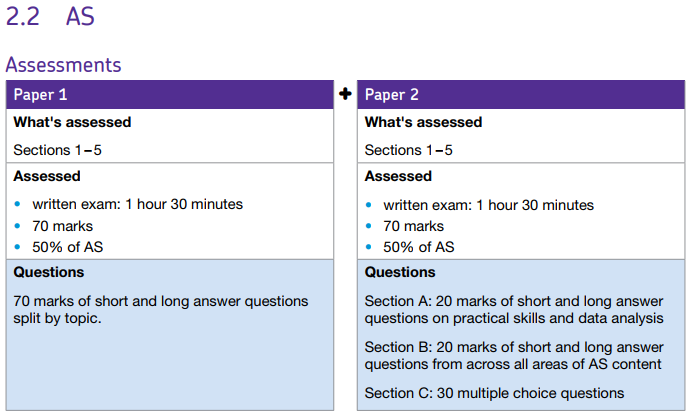 At AS level there is one 2 hour and 30 minute exam taken at the end of the course. A wide range of question types which include multiple choice, short answer and extended response questions. All students will sit the AS papers at the end of Year 12, to give them a good indication of how they are progressing on the course, as well as providing firm data for future university or job offers post Year 13. Students who wish to sit the full A level and move into Year 13 must achieve a suitable grade to continue on the course. What other courses can I combine A level geology with? Therefore if you are interested in geology it can really complement many other areas of study, helping to develop your scientific understanding of the world. The definition of physics is “the study of matter, energy and the interaction between them”. Physics is a fundamental scientific discipline and the study of physics aims to try to answer some of the most difficult and interesting questions, such as how did the universe begin and why does it behave the way it does? Observation and experimentation within the field of physics has made significant contribution to advances in technology and our theoretical understanding of the universe, and the search to discover even more about the world and universe we live in is the fundamental ambition of the study of physics. This will give you a firm foundation helping you to develop and deepen your knowledge from GCSE and includes topics such as quarks, Newton’s law of motion and projectiles. In your second year you will study the topics listed above and these will extend your knowledge and skills to prepare you for your next steps into industry or further study. The A level course requires you to complete a minimum of 12 required practicals (although we offer numerous other practical opportunities throughout the course). A student that successfully completes the practicals and demonstrates the required level of competence in the skills will be awarded a Practical Endorsement – Pass as part of their A level physics certificate. 6 of the practicals are completed in Year 12 and 6 in Year 13. The practical endorsement is only awarded to those who qualify and to students who study the full A level. 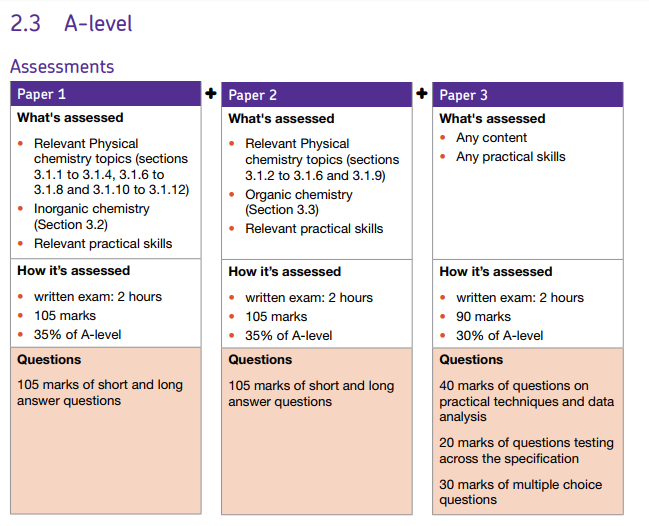 Below is a section from the AQA A level physics specification, showing how the course is assessed. All students will sit the AS papers at the end of Year 12, to give them a good indication of how they are progressing on the course, as well as providing firm data for future university or job offers post Year 13. Students who wish to sit the full A level and move into Year 13 must achieve a suitable grade to continue on the course. What other courses can I combine A level physics with? Therefore if you are interested in physics it can really complement many other areas of study, helping to develop your scientific understanding of the world. Past students who have completed A-level physics have gone on to university to study and industry to work in the following areas; however the possibilities are almost endless. Psychology is the scientific study of behaviour. Psychology involves the scientific study of people: how they think, how they act, react and interact. Psychology is concerned with all aspects of human behaviour and the thoughts, feelings, and motivation underlying such behaviour. Psychology is a popular university subject, can lead to a variety of careers and has significant real life application. Students need to have achieved grade B at GCSE in English, Maths and Science to cope with the academic rigour of the course. Students with grade C may be accepted. We study AQA A level Psychology ‘A’ specification and full details can be found at www.aqa.org.uk The course covers theories and approaches in Psychology, the scientific process of explaining human behaviour and research methods used in Psychological investigations. The AS course is examined in 2 units, 1 in January and 1 in the summer, both units require short written answers. A2 is also examined in 2 units with 1 in January and 1 in the summer. 1 of the 2 A2 units requires longer essay style answers. There is no coursework involved however, students will be given the opportunity to carry out their own experiments. There are no compulsory costs for this course although you may choose to purchase revision guides. You will have to pay for any exams you may decide to retake .